This simplistic style computer desk is a perfect furniture to fit your home or office. With its large full-size workstation, this desk provides you a unmatched convenience for your work. 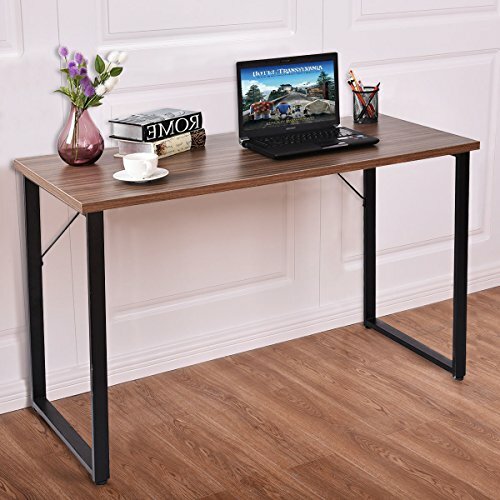 Made of high-quality particleboard and powder-coated steel, this computer desk is sturdy, durable and provides years of sturdy and reliable use. Don't hesitate to add it to your cart! 【Simple Design & Modern Style】The design of the Tangkula computer desk is modern and simple. The computer desk combines wood and steel to create a stylish and minimalist style. It is ideal for decorating a bedroom, living room, study or your office. 【Multi-function Use & Suitably】This Tangkula computer desk has a variety of ways to use it. This multi-functional table can be used as a computer desk, desk, writing desk, side table, coffee table , etc. You can put it in your bedroom, living room, study, office and other places. It can be adapted to a variety of room decoration styles. 【Durable & Sturdy】The contemporary style computer desk featuring thick particleboard and steel frame, is very durable and sturdy & anti-scratch and rust-free. Spacious wood table top will hold many items. There are four foot pads on the table foot to prevent the table from scratching the floor. It is enough to meet your daily needs. It could provides years of sturdy and reliable use. 【Shipping & Customer Service】 Ups or usps will deliver the item to your house in 3-6 business days after you placed an order. We packed computer desk as good as we can, if there is any damaged parts, please contact us first and offer us pictures of damaged part, we will solve the problem as the way you want.